Lockhart Smokehouse is updating their website to get ready for their opening this Wednesday and they finally have a menu page. I notice they are asking $5.25 for a single Kreuz sausage link and $5.50 for the jalapeno. Compare that to $1.50 and $1.80 in Lockhart! Holy mark-up, Batman!! Maybe it's a typo and will change. Yeah, that's it. It's a typo. Sure it is. Hah! They took all the prices off their menu page today. Hah! I had planned to go over for opening day, but I believe I will just wait til next week. I don't think I want to stand outside waiting in 20 degree weather. The top ten ways to tell if you are eating too much BBQ. 10. You can't find a shirt without grease or sauce stains. 9. You drop three times daily and salam towards Lockhart. 8. The hematologist tests your blood and declares it sweet or spicy. 7. Your significant other starts rubbing charcoal behind their ear instead of perfume or cologne. 6. Your cholesterol test breaks the equipment. 5. You'd rather have smoked brisket than steak or prime rib. 4. You use BBQ sauce at breakfast. 3. You see a truck pulling a BBQ pit and you do a U turn and follow them. 1. You fart and it smells like wood smoke. Lockhart Smokehouse opening next Wednesday!! Wooo Hoo! A date has finally appeared on the Lockhart Smokehouse website!! Wednesday, Feb. 2nd! 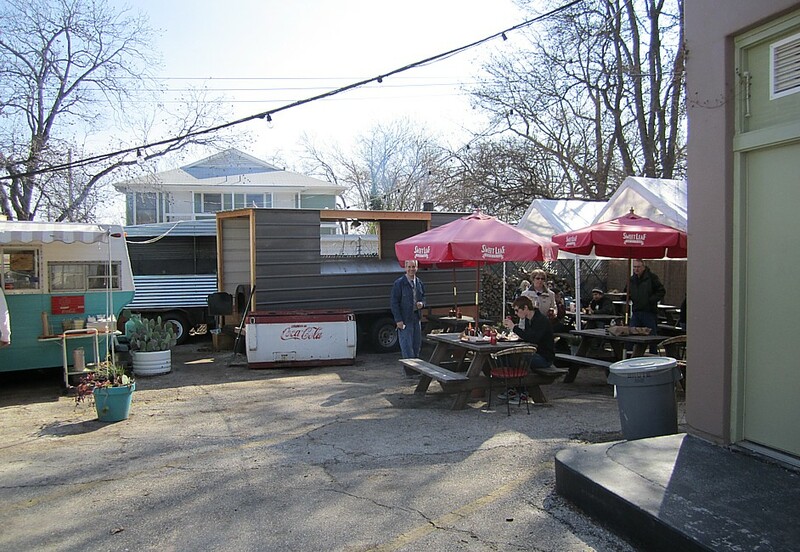 Well it is hard to write something new about the little Franklin BBQ trailer in Austin. The BBQ blogosphere (as well as print media) has been buzzing about this little joint almost from the moment they opened. All I can add is that all the superlatives that have been written previously are spot on. There are just no negatives to write about their food. 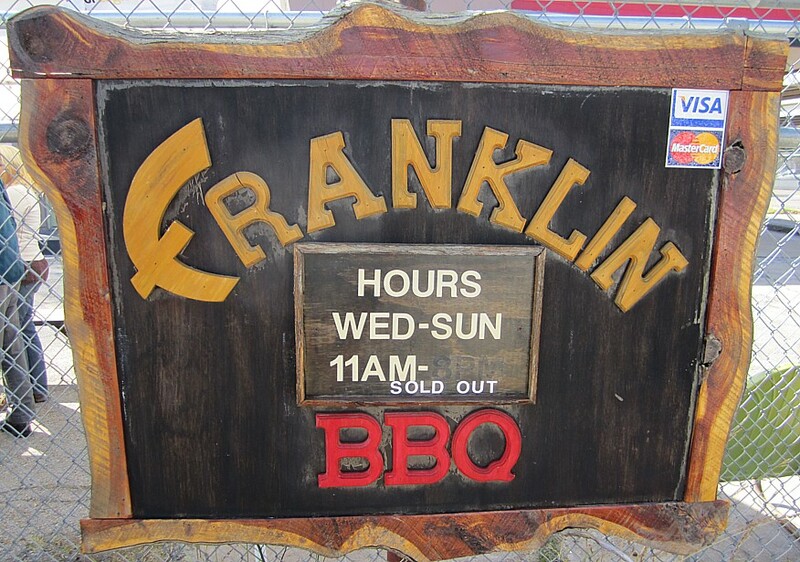 Considering I had just eaten at my all time favorite joint just 24 hours before, it is pretty easy to say Franklin was better. I want to eat there a couple of more times (to check consistency) before I push City Market in Luling down to my number 2 spot, but I think it will happen. In addition to my 2 meat plate, I got 2 lbs of fatty brisket to go, and I don't think I got enough. 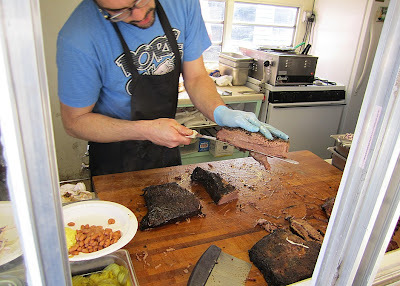 The brisket had a deep black crust full of smoke flavor with a slightly salty taste. The fat was so perfectly rendered it turned liquid when pinched. The brisket was so tender that the slices stretched apart like an accordion when lifted from one end, but they did not fall apart. Tender, juicy, smoky, brisket nirvana. The ribs were also cooked to perfection. They were tender and juicy, yet not falling off the bone. When you picked one up by the "handles" and took a bite, it left a perfect, effortless bite mark. Rib nirvana. The sides I had were pretty standard beans and mustardy tater salad, but who cares about sides when you have meat nirvana? I didn't try the sausage, so I guess I will have to go back. Darn. We got there about 10:30 and were number 6 and 7 in line. By the time they opened at 11 there were around 30 folks waiting. Most folks also order meat to go, in addition to their plate, so they tend to run out quickly. Go early to avoid disappointment. After a small fire shut them down a few weeks ago, we had to go by Ruby's to see that everything is alright. It is NOT alright! They no longer serve their wonderful fried potatoes. The lady behind the counter said the fried potatoes had caused the fire and were no longer on the menu. I said "Don't blame the potatoes!!" but, alas, their potato anger continues and they are now mashing them. I guess when someone mashes their finger they will blame the potatoes. Oh well. A sad day at the loss of one of the greatest side dishes I have had at any BBQ joint anywhere. Despite my breaking heart over the loss of their wonderful side, I knew their brisket would make up for it so I settled on a brisket plate with mashed potatoes and mac and cheese. The brisket was pretty good, as usual, but a tad dry (I bet the potatoes are to blame). It was tender with decent smoke flavor. The mashed spuds were ok, but no rave-up. The mac and cheese was pretty pathetic. Don't bother. 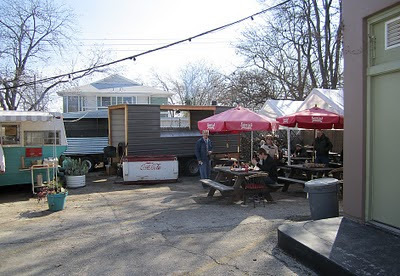 I'll be back at Ruby's again, but I will always be begging for those fried potatoes. Say it ain't so, Rick! Say it ain't so!! Well after my fine meal at City Market in Luling, I backtracked to Lockhart to load up on my favorite jalapeno cheese sausage. 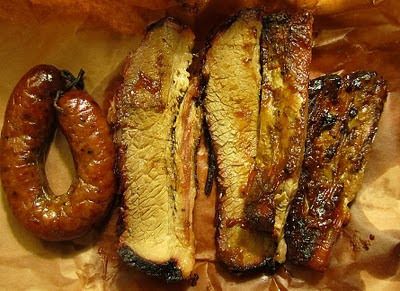 I got a few fresh ones off the pit for my buddies in Austin, then went into the dining room and ordered 3 boxes of cold sausage to import back to DFW. The fella rang me up, put together 3 boxes, then went off to the cooler to fill them up. A few minutes later, he came back with the sad sad news that they were ALL OUT! Waaaaaaa! A 250 mile trip and they're out! Waaaaaaaa!! Oh well. I got a refund and now I'm REALLY looking forward to Lockhart Smokehouse opening in Oak Cliff. They will do the importing for me, from now on!! 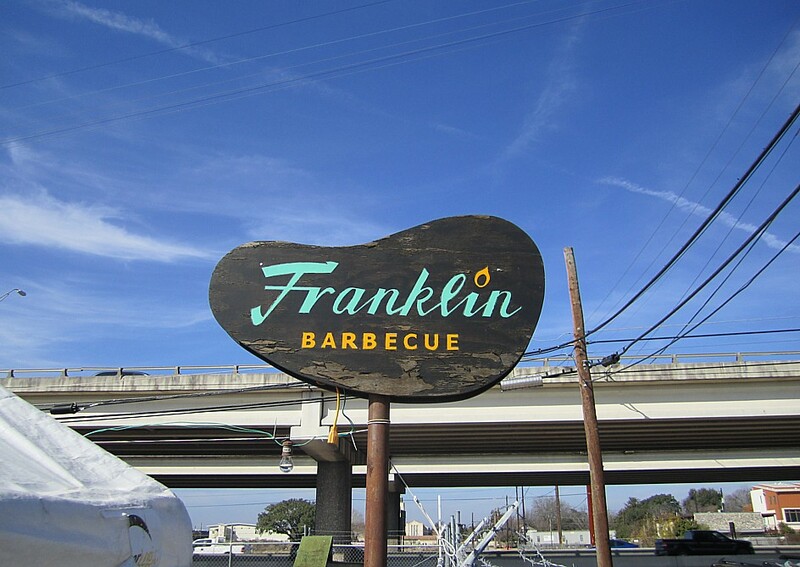 Ah, yes, back to my favorite spot in the BBQ universe. Everything was as wonderful as it always is. The brisket was moist, tender, with great smoke flavor. The ribs were perfect tenderness and chin-dripping juicy. Just perfect ribs. The link had decent spice and the perfect moisture content within a snappy casing that was an easy chew. That's why I come back here again and again, because I love their BBQ. The Lockhart challenge went off as promised on Monday, January 17. The 252 mile trip came off without incident and I rolled into Lockhart about 7:30 pm the previous evening. I prepared as if judging a big BBQ cook-off by not eating anything the previous day. I actually planned to stop by Black's Sunday evening and have a bite of brisket, but found them closed at 7:30 pm, despite the fact they supposedly stay open til 8. I don't know if there was a private party going on or what, but there were lots of cars around and the lights were still on. On the way down to the hotel I noticed Chisolm Trail was still doing business, but I decided to just wait until morning. I ordered the same thing at all 4 joints, 1/2 pound of fatty brisket, 2 pork ribs, and a ring of sausage. My thinking was I wanted several slices of brisket to choose from, as in a judged contest. I also wanted 2 ribs for the same reason. I got a rib tip at both Black's and Smitty's, so it was a good thing that I also had an inside rib to compare with the other joints. 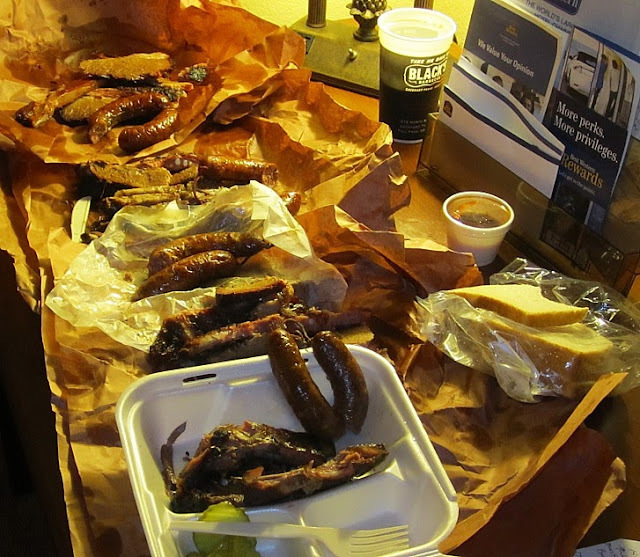 The rings were jalapeno cheese at Black's and Kreuz, but just sausage at Smittys and Chisolm Trail. I brought ziploc bags and a cooler for leftovers. I rolled out of the hotel about 11:45 am on Monday and headed north up the main drag. Chisolm Trail has a nice drive up window, so I decided right there I would get everything to go and sample at the hotel room. That proved to be a good plan. There were 3 cars in front of me and it took about 10 minutes to get up to the window. Next over to Smitty's and Black's where there was almost no waiting. I got a cup of sweet tea at Black's, but took one sip and it tasted like sludge. I poured it out but kept the souvenir cup for beer back at the hotel. 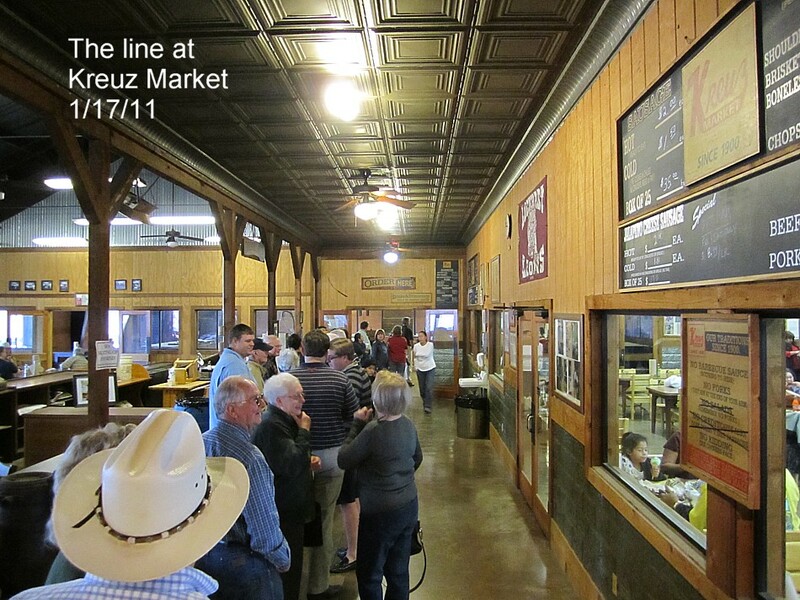 As I pulled up to Kreuz it was clear they were very busy. The parking lot was packed, and they have a huge lot. When I walked in the door I found almost 40 people waiting in line in front of me. Now that was a surprise! It was about 12:10 but I guess around lunch time a few minutes makes a big difference. The line moved quickly and I was out in about 10 minutes or so. I was back at the hotel by 12:30. 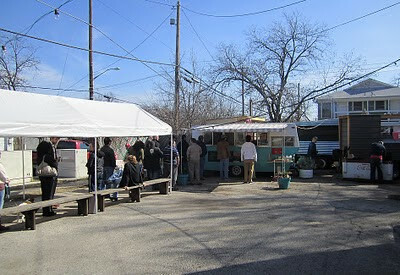 Passing by Chisolm Trail I noted their lot was packed and they had 5 cars in line at the drive thru. Smitty's gravel lot was similarly full. Now I want you to appreciate how lucky you are that I had the will power to take pictures FIRST, before digging in. Not only was I hungry, but I had to smell all that BBQ in my truck, plus 4 smoke pits, with nary a bite. You'd better enjoy those pictures! Just for grins, here's the cost for the same meal at the 4 joints. 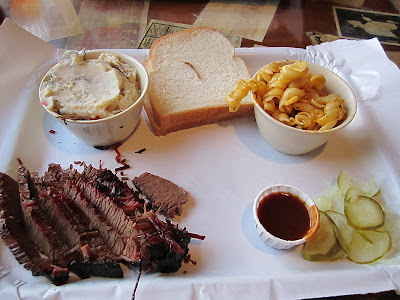 Chisolm Trail, $8.84, Smitty's $9.70, Black's (minus the tea) $9.78, Kreuz $13.30. Chisolm Trail threw in a small container of sauce, plus 4 slices of white bread. Black's was the only place that handed me a receipt. Now before the fun begins, let me just say, as usual, this review is for this meal on this day. Experience has shown, over and over, that any place can serve up a great meal or a horrible meal at any given time. The truly great joints are those who serve up consistently great meals time after time. I have eaten at all of these places before and probably will again. I just thought it would be fun to sit down and try all 4 together and see how they compared. Of the four, Black's came out on top for tenderness and for their deep smoky flavor, Chisolm trail was second, again with good tenderness and a slight smoke flavor. 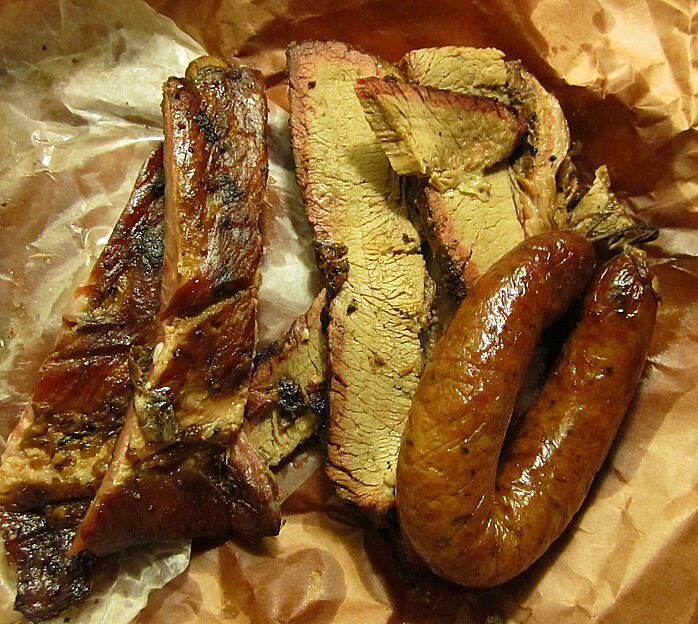 Kreuz and Smitty's had a very similar salty taste with Kreuz's brisket being the more tender of the two. I did the standard KCBS pull-apart judging test and Smitty's was definitely tough and chewy. Both Kreuz and Smitty's needed sauce, at least today. Of the four, Black's again came out on top, but Smitty's was a close second. Both left a perfect bite mark and pulled away from the bone just right. 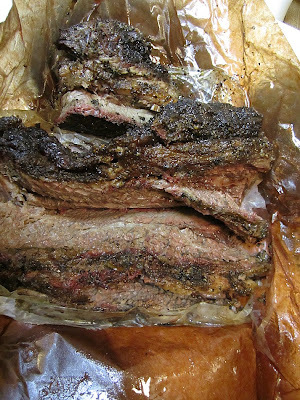 Black's had a deep smoky crust of a bark while smitty's had a very nice sweet glaze. Both were very nice ribs, but different. Chisolm Trail's rib was chewy with decent smoke and a salty flavor. The ribs from Kreuz were overcooked and chewy as leather. I do like their pepper rub but these ribs were just too chewy. Sausage was the only category where I was not exactly comparing apples to apples. Two were jalapeno cheese and two were plain sausage. However I was surprised how easy it was to pick my favorites here. Kreuz was easily my favorite. I guess that should be no surprise since I often take cases of the stuff back to my freezer (and shall this time, as well). However Smitty's ring was the clear number 2 of the 4. The two previous times I had Smitty's sausage it was way too greasy for my taste. This time they were spot on, with just the right amount of wet to dry. That was an excellent flavorful link even though it was not as spicy as I prefer. Chislom trail came in next with even less spice. The surprise was I got a bad link at Black's that was clearly inferior to the other 3. It was downright mushy with little flavor at all. Surprising, considering it was supposed to be jalapeno cheese. So who is the winner? Me. I win because I got to sit down and eat from all four at the same time. 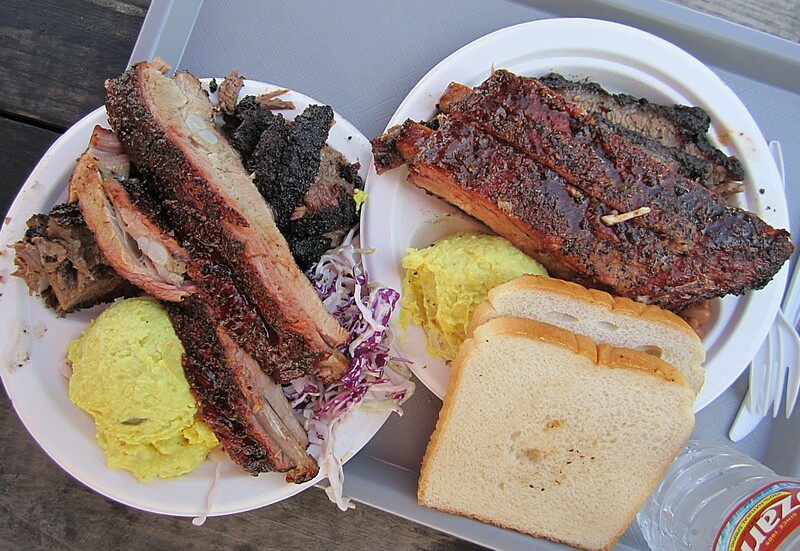 It was interesting to compare brisket to brisket and rib to rib. That would have been harder to do had I not taken them all back to the hotel. Testing back and forth between the samples to find the different flavors and textures was definitely helpful and interesting. It would be even more fun to do blind judging from the same spots, plus maybe throw in the two from Luling, just 15 minutes south. Now there's a challenge to look forward to in the future! I guess if I had to choose, Black's would still be my favorite with Smitty's and Kreuz being about equal, and Chisolm Trail being close behind. I think the real deciding factor today was Black's excellent brisket. That is something they consistently have done well, time after time. That won't stop me from buying 3 boxes of Kreuz jalapeno cheese sausage tomorrow! 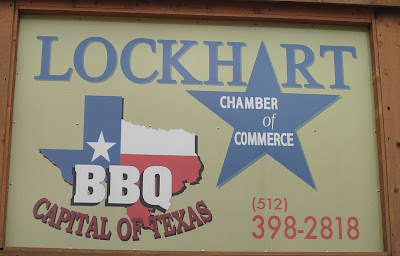 The bottom line is there is some pretty good BBQ in Lockhart and you can have a good meal at any of the 4 places in town. I will not identify the individual photos, try to guess which is which! Drew over at Man Up had the question, "What's your favorite Lockhart BBQ joint?" a few months back. 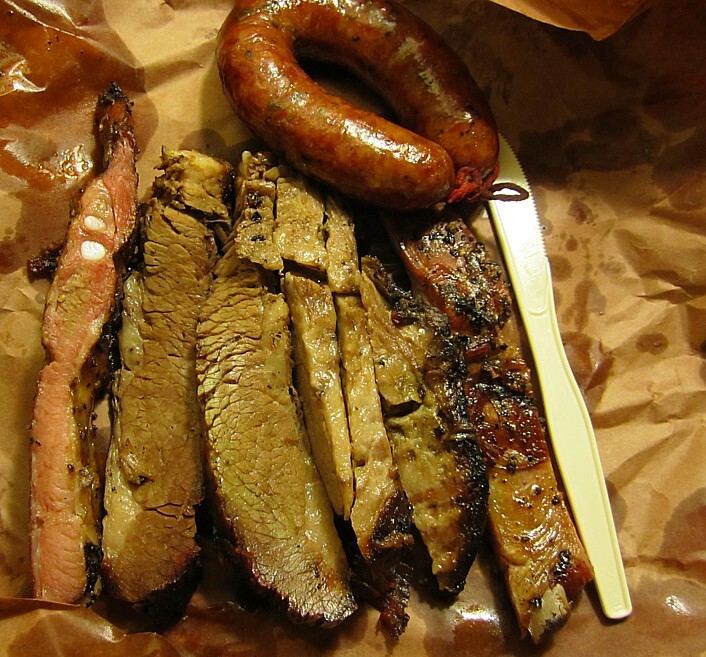 We've eaten at all of them, some more than others, and Black's and Kreuz have always been my favorites there. However it got me to thinking, why not sample all 4 in one day for a full on comparison? They are all just a few hundred yards apart, so why not? Next week, I'm going to be doing just that. I haven't decided whether I'll sample them all "in-house" or get it to go and compare them all back at the hotel. Guess that will be a game time decision. 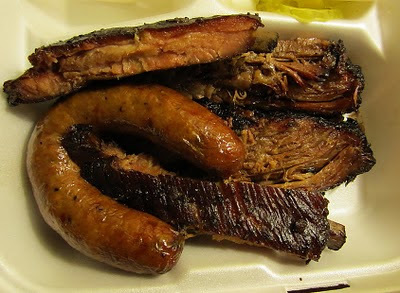 However I am only going to have brisket, ribs, and sausage at each joint, and test them back to back, sort of like competition BBQ. I know who the ultimate winner will be. Me! Because I will get to eat some mighty good BBQ. I can't think of a better way to start off my BBQ sampling in 2011! 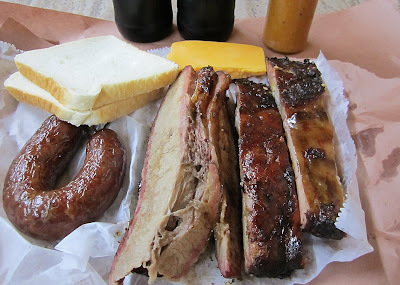 So, my little brother lives just a few blocks from the "opening soon" Lockhart Smokehouse in Oak Cliff. He calls me this afternoon to say "My friend just tweeted me that they are giving out free samples!" I figured, being that it was in the afternoon, they probably wouldn't have much left, and by the time I made the 30 minute drive over it would have been a wasted trip. I told my brother to go grab some and let me know how it was. Well, I was right not to jump in my truck for the ride. He was less than 5 minutes away and missed out. I noticed they had a post on their website for free samples at lunchtime today, but I guess he heard too late. Next time! I am betting they open the week of the 16th, because I will actually be in Lockhart that week! More on the "Lockhart Challenge", later! !